A ruggedly constructed short- to medium-throw follow spot, the Luminator produces a narrow, hard- or soft-edged beam which zooms from 1.3 degrees to 9.3 degrees. With top-mounted iris, color boom, and dimmer control handles, this easy-to-use follow spot is designed to utilize the unique high performance FLE, ENX and FXL quartz- halogen lamps. 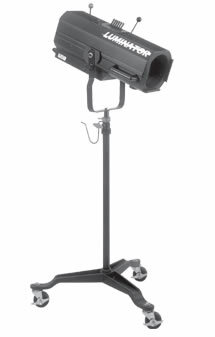 The luminaire can be used in any application where manual control of a lighting beam is required to follow a performer and to vary beam size, quality and color.